Filtronic Broadband Limited announced highly integrated E-Band transceiver modules capable of N x 10 Gbps applications. Rohde & Schwarz will supply test and measurement solutions to Qualcomm Technologies to produce engineering samples of its SDR051 5G RF transceiver in readiness for 5G deployment. Infineon Technologies and InnoSenT GmbH have released a surface-mountable radar motion detector operating in the 24 GHz ISM band. The K707 Digital Receiver from Innovative Integration supports two FMC-310 plug-in modules providing up to 6 antenna inputs, 128 independent channels of DDC, and one spectrum analyzer embedded in a Xilinx Kintex-7 FPGA. It supports monitoring and/or recording of wide- or narrow-band spectra or channelized IF band data. The receiver supports contiguous recording at 1,300 MByte/s to four SSDs until running out of disk space. Richardson RFPD announces participation at EDI CON USA 2016 will include live demos, new products and Analog Devices' Radioverse™ RF wideband transceiver evaluation board giveaway at Booth #806. UMS has introduced a state of the art fully integrated 24 GHz transceiver solution for industrial sensor and car radar applications. The K706 Digital Transceiver from Innovative Integration supports two antenna inputs and four independent channels of DDC, two channels of DUC, and one spectrum analyzer embedded in a Xilinx Kintex-7 FPGA. It supports monitoring and/or recording of wide- or narrow-band spectra or channelized IF band data. The analog front-end is modularized via an FMC site which, fitted with an FMC-1000, employs dual 1 GHz 14-bit ADCs and DACs. The product supports contiguous recording at 160 MByte/s to internal 1.8” SATA drives until running out of disk space. Analog Devices Inc. (ADI) introduced a low power, high performance, radio transceiver for battery powered applications. The new transceiver enables more reliable wireless radio connections with fewer retries and packet losses as well as longer battery lifetime. The ADF7030-1 features a highly sensitive receiver and superior immunity to signal interference as well as low power modes, including the industry’s lowest current in sleep mode. 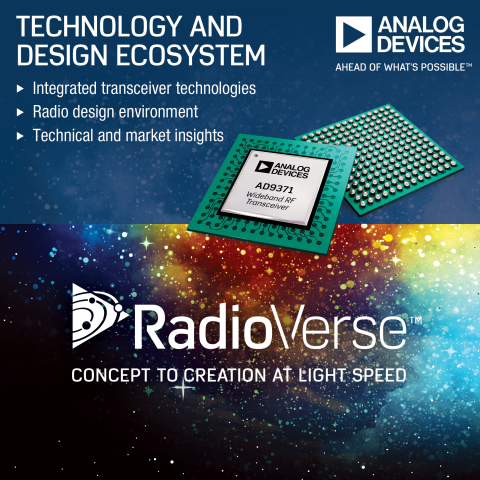 Analog Devices Inc. (ADI) unveiled the RadioVerse™ technology and design ecosystem, which provides customers with integrated transceiver technologies, a robust design environment, and market-specific technical expertise to move their radio designs from concept to creation quickly.